Photo by Duy VO (Copyrights Saskia de Brauw). Florian DAVID: Thank you very much for engaging with us, we are honoured and thrilled to have you; how must we pronounce your last name, ‘de Brauw'? Where does the name come from and does it mean anything? 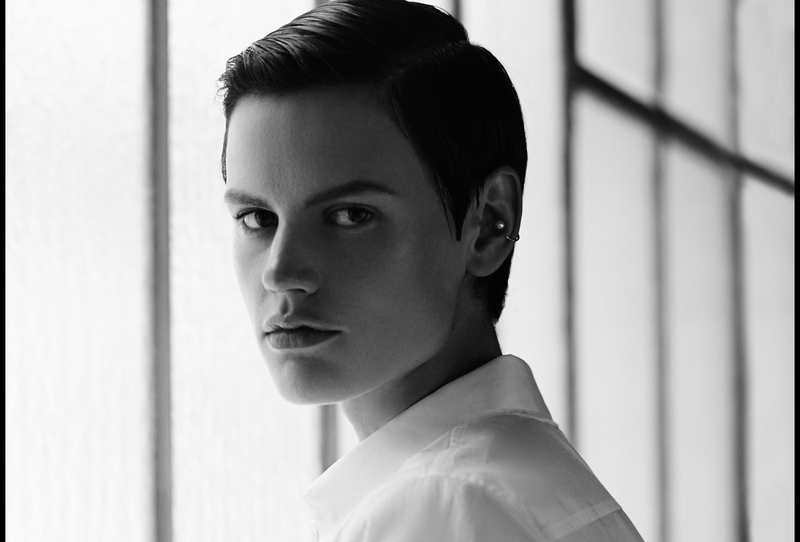 Saskia DE BRAUW: I don’t think my last name has any specific meaning. My grandfather used to joke and say big brows run in our family, but this definitely does not count for me! DAVID: Let’s start with a question that you like to ask strangers in the streets for your art projects: Do you have a story to share with us today? DE BRAUW: My daughter is sleeping in her bed. Her father just told me how happy he becomes when he looks at her. This fills me with joy. Indeed there is nothing more beautiful watching her wake with a huge smile. She is still so pure and full of goodness. Would it be fair to call you 'A hunter of the ordinary’? Or do you see yourself more as an ‘Explorer’? DE BRAUW: In the ordinary one can find strangeness. I enjoy being surprised by these ordinary strange things in life. These things mainly come to you when you are open for them. Hunting them will never end in result. In the ordinary one can find strangeness. I enjoy being surprised by these ordinary strange things in life. DAVID: In his 1873 Time-Atom Theory, Friedrich Nietzsche wrote ‘Invisible threads are the strongest ties’. It seems to me this is something you experience vividly in your daily life, is it? DE BRAUW: I find the thought very interesting how, without us being very conscious about it, our lives are always connected. We travel in each other’s footsteps all the time. It can also be consoling to think that we are not so alone after all. The way we are connected through space is something I have been working with for a while. Would you mind calling upon your memories and describing for us your grandmother in her house? DE BRAUW: The memory of my grandmother is deeply connected to the house she lived in. The house is like a container of my childhood. It was a place of play and freedom. It was a big house in the woods. The food I ate there, often from the garden or from the surrounding farms, tasted better than anything else. As I got older I made long walks with my grandmother in the forest. We spoke about many things of life. She was a spiritual woman. I remember most vividly the last pictures I took of her. She was drinking tea from a black and white cup in a colourful dressing gown. It was cold outside and a beautiful light hit her face. She was almost blind then and so ready to leave earthly life. It was cold outside and a beautiful light hit her face. DAVID: Do you believe in the soul? DE BRAUW: I do although I am not sure what it exactly is composed of. DAVID: Let’s talk a bit about your writings shall we? I love your writings. Minimalist. Unpretentious. Poetic. Intelligent. Sensitive. Sharp and cutting like glass. In a way it reminded me of Samuel Beckett’s. Like George Perec too, your prose focuses on the ordinary, the apparently banal. DE BRAUW: I don’t know I really write...I enjoy words very much, I have always loved words. When I started to travel a lot as a model I wrote long emails to my boyfriend. He encouraged me when he said that they were well written and beautiful. I then started collecting my short writings. DAVID: Does writing help you heal? DE BRAUW: It helps me to give things a place. But there is something I struggle with and that is the question on how can I describe that what I see as precise as possible. I am totally unable to do so. I hope by training my eye and my writing one day I will be able to do so. DE BRAUW: It was at art school when I read ‘Les Choses’ for the first time. But when I really fell in love with his work was a couple of years later when I read ‘Espèces d’Espaces’ given to me by my friend Philip Matesic. I read and reread and reread this book and I still do. DAVID: You write: 'In my writing I am drawn to the more bleak and fragile side of life’. Why do you think that is? DE BRAUW: I think because beauty can be found where vulnerability can be found, not in perfection, not in finished things. DAVID: What is your life purpose and what drives you? Most of us live a life asleep most of the time. I am driven by the desire to unveil parts of myself that have become very dark and inaccessible. DE BRAUW: It is tough question. I am trying to figure this out by living my life. Maybe one day I find the purpose of my life. I really hope so. Most of us live a life asleep most of the time. It sounds a bit pretentious maybe. I don’t think I am very ambitious. I hope to find simplicity, this is what I have lost somewhere on the way. Maybe I am able to find pieces of this back again. Has this changed much according to you; are humans today questioning enough the world in which we live and the way we live? DE BRAUW: I am not sure. It is difficult to live that consciously every day. It is like meditating. You have to be present and not lost in passed or future thoughts. What you see nowadays are people walking while watching a screen or worse, speaking to a screen ignoring the world around them. I do find this quite disturbing. What you see nowadays are people walking while watching a screen or worse, speaking to a screen ignoring the world around them. DAVID: You work across several disciplines, installations, writing, photography…Is there a common foundation to your creative process? In other words, what creative process do you go through and is it the same for all types of works? DE BRAUW: I am always interested in the question how our lives are connected through time and space. Invisible threads as you mentioned earlier. My ideas cook for a very very long time before becoming anything. I am very slow if it comes down to my own projects. In order to find I collect things related to the subject, I read, I meditate, do yoga and then finally, after a long time a certain form will appear. The process of finding this form is an important part of my work too. DAVID: In one of your projects titled ‘Anagram’ in collaboration with your soulmate Vincent van de Wijngaard, the narrator (your shadow :) is facing her own reflection into some soulless high-rise building window and writes: ‘I can see myself but I wonder if anyone can see me’. The only beings paying attention to the world around them in that story seem to be the narrator - your shadow -, a cat, and a blind man! What is this story about, is it about Awareness? DE BRAUW: It is rather about a sensation of being a stranger and a melancholy feeling of being a lonely traveler. More atmospheric than narrative. DAVID: Why did you bring Vipassana meditation into your life? DE BRAUW: I longed for silence. To not speak to people for 10 days was incredibly refreshing! Your thoughts become quiet after sitting in silence for a couple of days. It is a big cleanse of the mind; Desperately needed some times. DE BRAUW: I see a lot that people do things for the sake of becoming well known or successful. I don’t believe real art can ever be about that. The most inspiring artist have created from the necessity to express thoughts, ways of looking at the world. I am hopeful that art in the widest sense of the word helps people to feel, heal, smile, be touched etc etc. We can still see nowadays when people are threatened the best works are made. When people can’t listen to music any more, people will find ways to make and listen to music anyway. DAVID: Your new book in collaboration with graphic designer Erik Haberfeld is titled ‘The Accidental Fold’. A way of giving a new life to rubbish or long forgotten objects encountered through your travels. How did you decide what to keep and what to throw for this project? DE BRAUW: When I walk the streets and find objects I decide to pick something up it firstly has to do with my state of mind. Sometimes you are able to see beauty in something very ordinary and sometimes you can not. Also it has to do with conversation, meetings, encounters I had prior to finding the object. Sometimes they relate or it is a way to remember that occasion. By now, as the collection is getting a bit bigger I also consider what I already have and what could be great additions. DAVID: How about in your life, how do you decide what you keep and what you throw? DAVID: Your photographic works too seem to be focusing on the fragility of life. In one beautiful picture you are holding a butterfly’s wing in Tokyo. What drew you to this wing? DE BRAUW: It seemed like a sign. I gave it to a friend of mine this wing. DAVID: Some of your art works reminded me of the works of Aaron Siskind, are you familiar with this artist? DAVID: In your old apartment there was a window that gave on a blank, grey wall and as the day went by the shadows of the opposite houses were gradually appearing on the wall. This gave birth to your installation ‘View from my window’, brilliant work visually representing time passing inside your apartment. What is your personal relationship with time like? DE BRAUW: I always have to remind myself to slow down, take my time and not do two or three things at the same time. DAVID: In another art experiment of yours, ‘Invisible Encounters', you spent a bit of time walking around town with several strangers who guided you through their daily routes as you were blindfolded and marking lines with paint to record their journeys. You seem to be looking at life like as if it is a multi-dimensional puzzle - which I really think it is. Everything is interconnected. Do you believe in God? DE BRAUW: God I see as something that is connecting us, maybe it is just the force of love or bliss or samadhi, nirvana. God I see as something that is connecting us, maybe it is just the force of love or bliss or samadhi, nirvana. DAVID: A few years back in Morocco you went to some ‘Ecrivains Publics', where illiterate people usually seek assistance with their administrative paperwork. You asked them to write on your behalf some letters in Arabic…To be sent to yourself! Why did you do that and did the writers think you were crazy? DE BRAUW: Yes most of them thought I was crazy or mocking them. It then became mainly about miscommuncation rather than communication. I wanted to do it because I just wanted to describe what I saw, dictating to someone else what comes up in your mind and what you see. But it did not work out the way I thought it would! DAVID: Did you ever write love-letters? DE BRAUW: Yes with my first boyfriend. DAVID: Has your definition of love changed since you’ve just become a Mother? DE BRAUW: Definitely. I could never imagine what feelings arise when you see your child smile, sleep grow. It is the most intense feeling. THANK YOU Saskia de Brauw. Saskia de Brauw's latest Art Book, 'The Accidental Fold' can be found at COLETTE in Paris and at YVON LAMBERT BOOKSHOP, 108 Rue Vieille du Temple in Paris, as well as ordered online at DASHWOOD BOOKS, and also at PHOTO EYE, and of course via Saskia de Brauw's blog.